Last weekend a beautiful new gallery opened on the High Street in Dunbar. Look closely . . . left window, oh yes it's a Rich Johnson original! 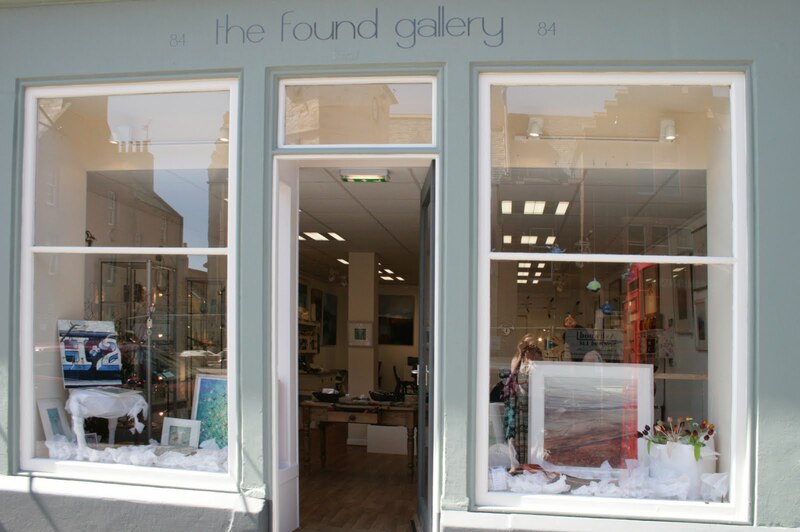 I can assure you The Found Gallery is beautiful as we visited yesterday to replace one of R's paintings which sold on the opening day, yay! There are so many splendid pieces within and owners Amy Christie and Simon Glover offer a warm welcome to a gallery of work they should be justly proud of. The vibrant paintings in the back corner shown above are by Siobhan O'Hehir whose work I first saw at the Crossing Borders Gallery, Paxton House. On my day working their last month I spent a lot of time looking up close at her work (fret not, my nose did not, at any point, make contact with canvas!) and the textures achieved with wax and paint are mesmerizing. Lace textured porcelain jugs by Stephanie Earl. A marvelous mooch around Dunbar followed and, as you may tell by the fact that I have left the house on a non work related venture, I have finished the marking work at last! Free time is amazing, in the last day and a half I have weeded and planted in the garden, cycled and wandered, scraped, sanded and oiled the garden benches. Am I ever glad that's marking done for this year!